Before the age of computer generated special effects, movie makers used several tricks to make the most of miniature photography. One of these tricks is called forced perspective. This technique exaggerates the apparent depth of a scene by placing large scale objects near the camera and small scale objects farther back. For example, placing a 1:10 scale miniature tree close to the camera and a 1:20 scale tree further back increases the apparent distance between the two trees. Forced perspective compensates for the limited depth of field of cameras (the range of objects in a scene which are in focus). Without it, a miniature set depicting a large area, such as a battlefield, would be very deep, and it would be difficult to keep everything in focus. On a recent trip to Guayaquil, Ecuador, I stumbled across Museo de la Miniatura. 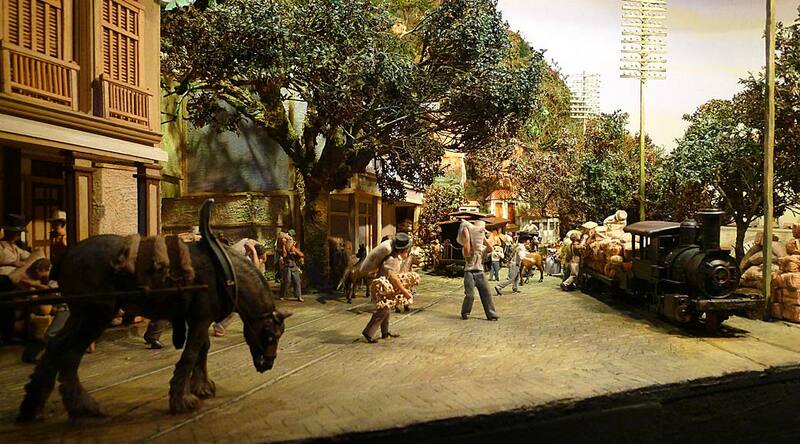 This museum houses a series of dioramas illustrating the history of Guayaquil. The dioramas are a few metres wide and over a metre high, and have lighting that changes as a pre-recorded narrative is played over speakers. What impresses me most about these dioramas is their masterful use of forced perspective. Although not designed for filming, these expertly crafted dioramas employ forced perspective to inject more visual depth into a confined space. One of the dioramas is pictured above. Although you might not realize it from casual observation, the train tracks are not parallel, and the models near the front are larger than those in the back. This creates a scene of much greater apparent depth. Due to the need to create miniatures in multiple scales, forced perspective is more time consuming for the artist than creating a standard diorama with everything rendered in one scale. But the end result is brilliant. I used forced perspective back in my film student days, creating a set of three landing pads for a spacecraft touchdown scene. By making each landing pad in a different scale, the scene had much more apparent depth, and it worked better. This project was done entirely on 16mm film and all special effects had to be done in-camera. With forced perspective, I was able to keep everything in focus. The near total reliance of today’s filmmakers on computer generated effects has a downside, in that much of the ingenuity which used to lend magic to filmmaking is now all but obsolete. Techniques like forced perspective aren’t needed when you have software that takes care of everything. It’s nice to know that at Museo de la Miniatura, the magic of forced perspective is alive and well.